Everything seems correct except this error is persistent. Gradle sync works fine too. Lets see how we can resolve this. Before we see how to resolve this issue make your layout file is in correct directory structure. It should be under layout folder which would be under res folder. In my case it was release. Just switch the version and then switch it back. In my case I switched it to release and then back to debug and the error was gone. If above 2 methods did not work out for you then Close all open tabs and reopen them. 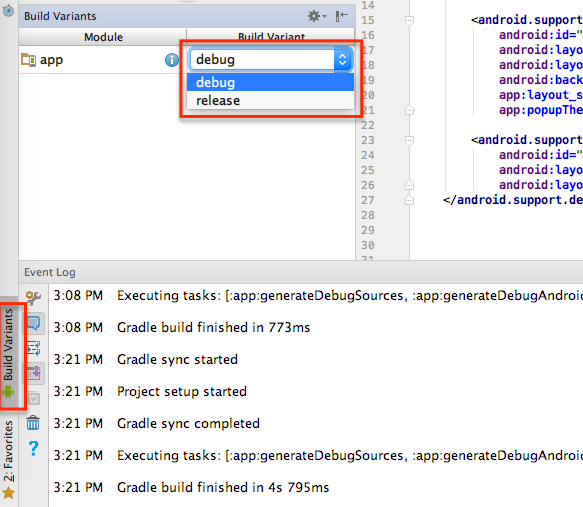 Last but not the least - restart Android Studio. What to do when I have no build variants tab at the bottom left of android Studio? From your View menu, select Tool Windows, then Build Variants. Then you will see either "debug"or "release", and you can switch between these. Im having the same problem and your fix did not solve it but I believe its because I created a couple new layout directories outside of android studio because I could not get it to do it. I need a layout_v15 and layout_v16 and a layout for the rest. My new_app_widget.xml files in each directory do not show up as one file in android view like it used to. Instead I get the uri not registered error. I am getting this error in my AndroidManifest.xml file. In my layout files, the xmlns line is fine. I have tried all these solutions, but the problem persists. Do you have any suggestions? The project is imported. The original was probably created in Eclipse. Mine too is displaying "Nothing to Show".